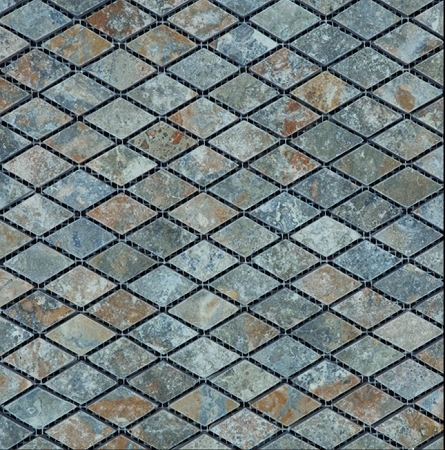 Golden Green Rhomboid 1x2 Tumbled is a mosaic composed of diamond-shaped travertine tiles. The tiles come in various shades of gray, blue, and green with influences of hazel. They are cut down the bedding plane exposing the gold patterns. The surface has a more matte finish due to the tumbling process. The tiles have more worn edges and are arranged in a rhomboid pattern. Golden Green Rhomboid 1x2 Tumbled is designed in an eye catching pattern that immediately draws attention to the space. It is versatile enough to complement both classic and contemporary designs. Golden Green Rhomboid 1x2 Tumbled is great for walls in rooms that have a contemporary feel. It can also be used on the walls and on the floors in the shower area. Always ensure that the tile is sealed when installing in an area where water is present.